In December we went in Sicily for a blog tour organized to discover the Selinunte District, in the west part of Sicily. As we told you in our latest article, it was a great experience to better know this wonderful area. In this article and in the next one I suggest you one of the best itineraries in Sicily for the landscapes and the unspoilt nature. In winter, when all around you is grey, foggy, rainy and cold, what could be better then to go in a place that is mostly sunny and mild? Sicily is a Mediterranean island and its western part is a paradise for who is looking for some sunny days. It’s not difficult to have 20 degrees and dry air also in winter. If you travel in west Sicily you are going to see a lot of different sceneries. For example high and rocky karst hills close to Palermo, then, going southern, sweeter and lower hills and a little plan that is located in front to the sea, in the southern part of the Sicilian coast. Here you will see the typical Sicilian agricolture: very big fields, legacy of the latifundium, full of oranges, olive oil trees and vineyards. We leave from Castelvetrano, that is one of the most important historic centres of the Sicilian territory. 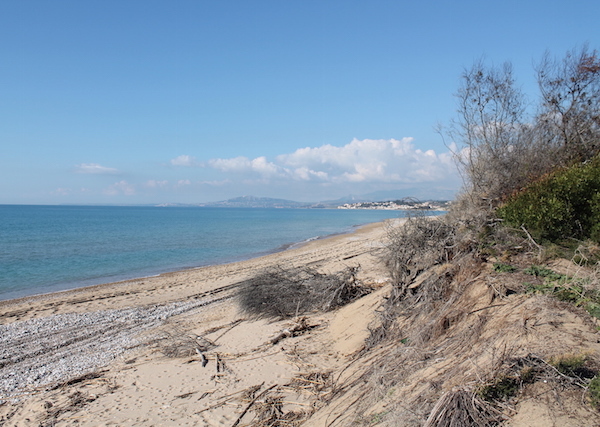 It takes 1 hour and a half toward Agrigento by car to reach the Natural Reserve of Torre Salsa. It is a perfect place for a one-day itinerary into the nature in Western Sicily, located in the south coast. It was opened in June 2000. 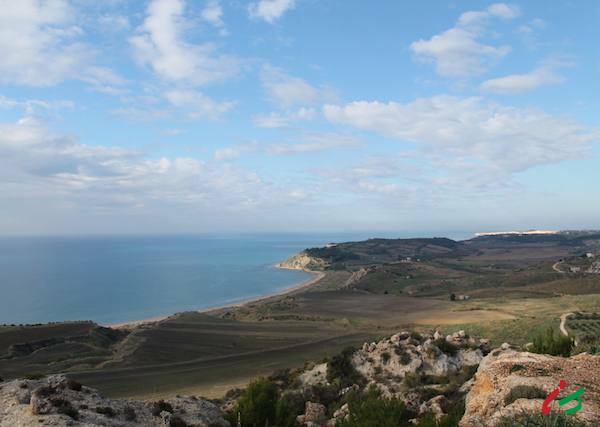 It’s 761 hectares and it’s managed by WWF and the Sicilian Region. Here, from Siculiana to Eraclea Minoia, the coast is like it was in the past: with high chalk cliffs, calcareous marl, clay layers. Close to the sea, the flora is typical of very dry places, only with bushes, and the hills sometimes are arduous, so you could reach the wonderful beach only walking along little path. Before reaching the beach, take your time to take some picture of this slice of heaven. The sea here is so clear and you can find really beautiful sea bottoms. The Reserve’s name, Torre Salsa, comes from an ancient sighting tower (torre is tower in Italian). The arduous nature was a luck for that place, because it preserved the area from the mass tourism. Here you will see little mountains, some streams, old caves and a place that you cannot reach in winter that is called ‘Pantano‘ (i.e. mud). That’s why there is a torrent that overflows, so you can go only when everything would be dry again, normally in summer. If you drive back for half an hour you will reach another astonishing location where you will be completely surrounded by the unspoilt nature. This reserve, protected by the Region, has the aim to protect the bird population, the Mediterranean brush and the downs. It’s about 206 hectares and is located in Ribera and Cattolica Eraclea. During your tour, you’ll see 2 kinds of wood: the first one is not native, it was a reforestation done in the ’50s. They planted a pinewood with some Eucaliptus and acacias. Walking into this relaxing track you will see some typical Mediterranean trees as mastic asparagus, miniature palm, tamarisk e carob tree. The rare vegetation is the one you can see on the downs, protecting them from salt and wind. At the end, you will reach the sea, with shaves of blue and light blue, and light sand, where you can walk or relax yourself thanks to the warm sun. We hope you enjoy our recommended Sicily itinerary into the nature. Next week we are going to suggest another itinerary to get in touch with the art and culture of this part of the region.